An artist's representation of NASA's Transiting Exoplanet Survey Satellite, or TESS, observing an M dwarf star with orbiting planets. Technicians help prepare the spacecraft for its mission. 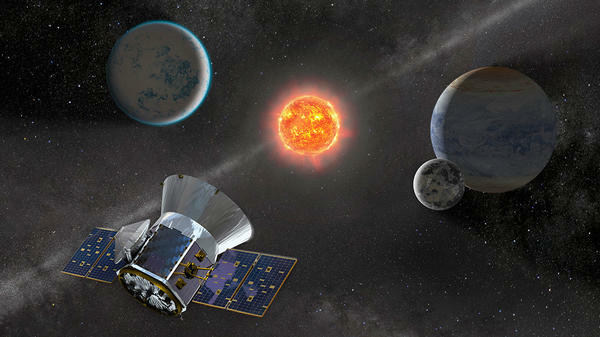 TESS is the next step in the search for planets outside of our solar system, including those that could support life. 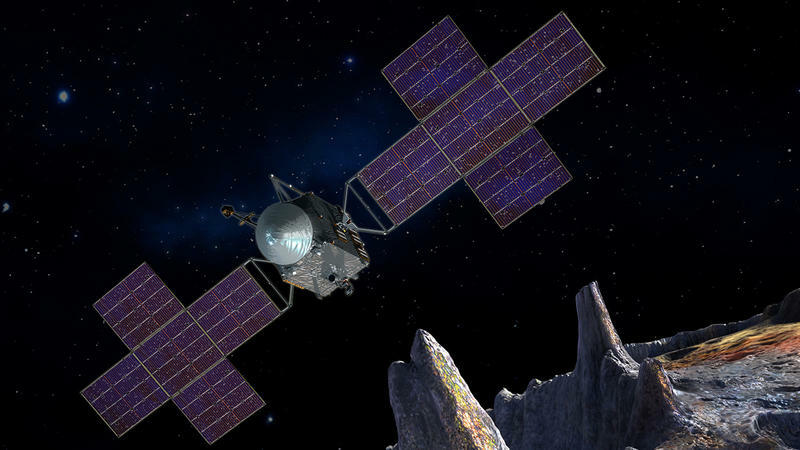 If signs of life are found on a planet beyond our solar system sometime in the next decade, they'll most likely be on a planet discovered by a NASA satellite that's scheduled to launch on Monday. The mission is called TESS, short for Transiting Exoplanet Survey Satellite, and it will spend two years scanning almost the entire sky to search for alien worlds. Scientists already know of over 3,000 planets around distant stars, thanks in large part to a previous NASA mission called Kepler. It spent years staring at stars in a small patch of the sky to look for a tell-tale dimming that meant a planet had passed by and blocked some of the starlight. The Kepler mission revealed that planets of all sorts of sizes are extremely common. "There are far more planets in the Milky Way than there are stars," says MIT astronomer George Ricker, the principal investigator for TESS. But he says the challenge with the Kepler discoveries is that the planets' host stars are far too faint to allow detailed follow-up measurements. "We know that planets in principle exist there," says Ricker, "but there's really not much more we can say other than that they exist." The planets discovered by TESS will be different, as TESS will search for planets around closer, brighter stars. "And so with the planets that TESS finds, we're going to be able to use a different set of telescopes and then try to find out if any of them are indeed somewhat like Earth," says Sara Seager, another MIT researcher who is working on TESS. The ultimate goal is to find small, probably rocky planets orbiting in a sweet spot around stars that's not too hot, and not too cold. Those planets could be studied using the James Webb Space Telescope that NASA is supposed to launch in a couple of years. Researchers would be able to use it to analyze the starlight that filters through the planets' atmospheres, looking for hints of habitability. "The most important thing, I think, would be to find signs of water vapor in a small planet atmosphere, because all life as we know it needs liquid water," says Seager, who notes that at the moment, "we're very far from knowing that something is like Earth out there." Astronomers are excited by the idea that TESS will give them a massive new catalog of relatively-easy-to-study planets beyond our solar system. The satellite is expected to detect around 20,000 planets, including hundreds of planets that are the size of Earth or not too much bigger, and the follow-up work is sure to go on for years. The planets found by TESS, however, might not be super-cozy little places, because the mission will mainly be targeting planets orbiting small stars called red dwarfs. These are the most common stars out there in our galaxy, and they're extraordinarily long-lived — which could give life time to emerge and evolve. But they're also known to send out scorching blasts of ultraviolet and X-ray radiation that could fry any life. "These small stars are just not necessarily the kind of star you'd want to live around, if you had a choice," says Ruth Angus, an astronomer at Columbia University. But she says that's where astronomers currently have the best chance of finding something with the available technology. "Those small stars will produce the biggest signals, and we have to start somewhere," says Angus, who remains hopeful about what could be found. "There are certain conditions that we need for the life that we're familiar with, but who knows if those conditions apply across the galaxy." If all goes well with the launch and calibration phases of the mission, the first haul of new planets found by TESS could be announced later this year. Tomorrow, a rocket is scheduled to blast off with a NASA satellite. It's a planet hunter that will spend two years looking for alien worlds. NPR's Nell Greenfieldboyce reports on how it will help scientists in their quest to find another Earth. NELL GREENFIELDBOYCE, BYLINE: Mercury, Venus, Earth, Mars, Jupiter, Saturn, Neptune, Uranus. For a long time, those were the only planets scientists knew about. In recent years, beyond our solar system, they've discovered over 3,000 more, thanks in large part to a NASA mission called Kepler. GEORGE RICKER: The most exciting things we've learned from Kepler has been that planets are extremely common. There are far more planets in the Milky Way than there are stars. GREENFIELDBOYCE: That's George Ricker, an astronomer at MIT. He says Kepler was really good at finding planets but not ones that scientists could study in detail. RICKER: There's really not much more we can say other than that they exist. GREENFIELDBOYCE: And that is very unsatisfying because after all, what scientists really want to do is find another planet like our own, one that some form of life could call home. I asked Sara Seager, also at MIT, how close we are to finding Earth's twin. SARA SEAGER: Far. We're very far from knowing that something is like Earth out there. 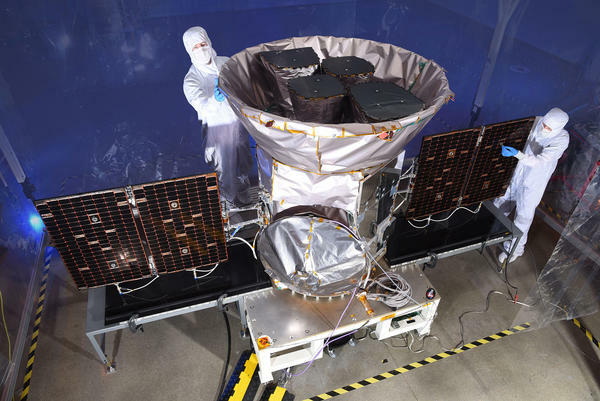 GREENFIELDBOYCE: That's why she and Ricker are part of a team that's working on NASA's next mission called TESS, for Transiting Exoplanet Survey Satellite. TESS will scan almost the entire sky, looking for telltale signs of planets around closer, brighter stars. This will make it easier for scientists to do follow-up measurements. SEAGER: And so with the planets that TESS finds, we're going to be able to use a different set of telescopes and then try to find out if any of them are indeed somewhat like Earth. GREENFIELDBOYCE: She says the goal is to find small, probably rocky planets orbiting in a sweet spot around the star that's not too hot and not too cold. Those planets could be studied using a big, new space telescope that NASA is supposed to launch in a couple years. It could analyze the planet's atmospheres. SEAGER: The most important thing I think would be to find signs of water vapor in a small planet atmosphere because all life as we know it needs liquid water. GREENFIELDBOYCE: Astronomers are excited by the idea that tests will give them a massive new catalog of relatively easy-to-study planets beyond our solar system. The follow-up work is sure to go on for years. Ruth Angus is an astronomer at Columbia University. RUTH ANGUS: If we detect life signatures on any extrasolar planet in the next ten years, then that planet will almost certainly have been discovered by TESS. GREENFIELDBOYCE: But she says that's a big if because there's reason to think the planets found by TESS might not be super-cozy little places. The mission will mainly be targeting planets orbiting small common stars called red dwarfs. And red dwarfs are known to send out scorching blasts of ultraviolet and X-ray radiation that could fry any life. Still, Angus says she's skeptically hopeful. ANGUS: There are certain conditions that we need for the life that we're familiar with. But who knows if those conditions apply across the galaxy? GREENFIELDBOYCE: She says they've got to start looking somewhere, and TESS will tell them where. Nell Greenfieldboyce, NPR News. Transcript provided by NPR, Copyright NPR. Here's a reminder that while you are out in the world buying groceries, picking up dry cleaning or catching up on The Crown, NASA's Mars rover Curiosity is on the red planet doing work. 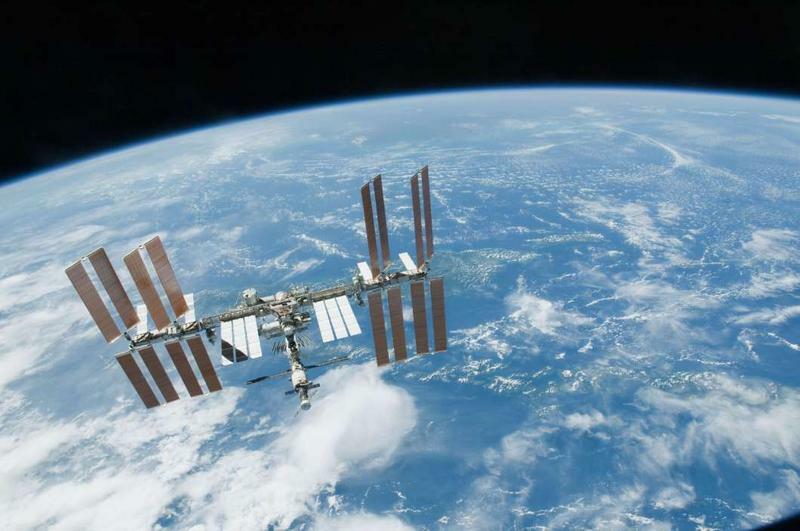 The Trump administration’s $19.9 billion budget for NASA calls for privatizing the International Space Station. Senator Bill Nelson is blasting the proposed budget. The budget proposal provides nearly $10 billion to support human space exploration of the moon. It pays for the Space Launch System and Orion capsule, that will launch from Kennedy Space Center, slated for a mission to the moon in 2020.